Soon after sunrise on Thursday morning we headed out on the road to beat the lorries – well, most of them – in a borrowed car. For us, it was a journey back in time: a 7 hour trip we first made nearly 25 years ago, with 3 small kids in the back seat. The Great North Road certainly hasn’t changed much: long, straight, narrow, peppered with potholes and occasionally missing altogether: suddenly a patch of bright red earth in the grey tarmac ahead is your warning sign – slow down! It’s not a drive you’d want to make in the dark, and it’s a real challenge in a wet season downpour. But on the way up, the weather was kind to us. We share the road with men on bicycles, hidden by 3 or 4 enormous bags of charcoal, thundering lorries and the occasional bus. However, Zambian lorry drivers are among the most polite in the world, and helpfully flash their indicators to show you when it’s not a good idea to overtake, and when the road ahead is clear. It’s impossible to get lost: drive out to Kapiri Mposhi, turn right, and stop when you get to Mpika. Still, we managed to miss the turning. We soon realised our mistake, but bitterly disappointed the roadside mug seller we stopped to ask, who thought he’d found a customer. Roadside sales are popular: suddenly, as many as 50 stalls will line the road, piled with bright red tomatoes and little else. 20 km further on, and the tomatoes have mysteriously disappeared. It’s chillies. Then, nothing but mangos. Honey appears for 10 km, and then it’s gone. As you travel north the sellers dwindle to groups of two or three: children as young as 5 or 6 hold up a live chicken, a bowl of chillies, a mushroom bigger than their head. About 300 km out of Lusaka, the spontaneous waving starts: children on the long walk to school; women with babies on their backs, sometimes even the men. It seems that in 25 years nothing has changed. But look a bit closer: the women traders still have a basket on their head, and a chitenge wrapped around their waist or fashioned into a sling for their baby, but a mobile phone hangs around their neck. Recent harvests have been good, and some of the houses sport a shiny new zinc roof. 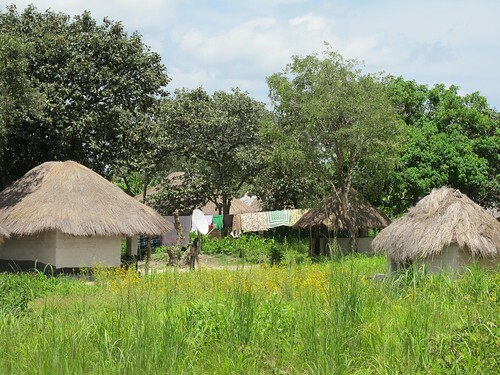 Even in the very rural Mpika district – an area the size of Wales, 600 km from Lusaka – solar panels have started to appear and, incongruously, we saw village huts sprouting a huge satellite dish! 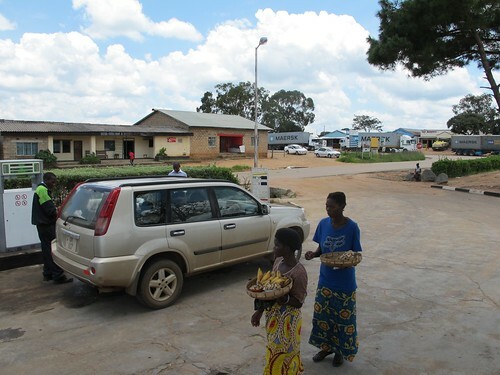 Mpika town has grown – and on the main road there’s an internet café. 25 years ago, we didn’t even have a landline telephone. So, yes we did go back in time, but we started to glimpse a very intriguing future…. The next 25 years are going to be very different. 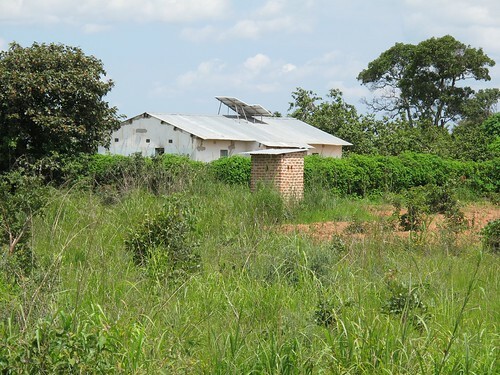 Solar panels, a zinc roof and latrine!